Dark rose to scarlet, depending on your soil Ph, this lily does tend to be the darkest of the double flowered Orientals. Cold, wet springs may lighten the red tint a bit as 'Doria' seems to be more sensitive to heat and cold for color intensity. 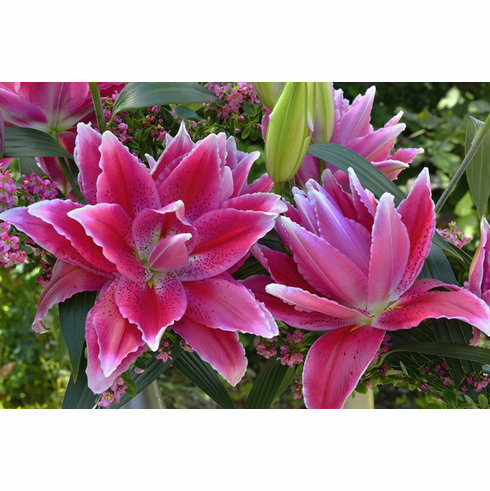 As with any of the double-flowered Oriental lilies, a more protected area, sheltered from hot sun or weather extremes, is best for the largest, and longest lasting flowers. Spicy Fragrance. 3 to 4 Feet. Late July Flowering.